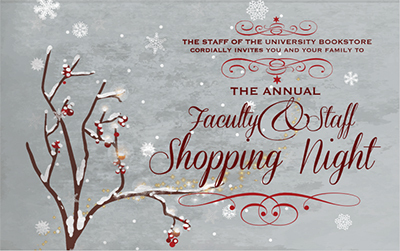 Wednesday, Nov. 18, 4:30-7:30 p.m.
Join us at the Bookstore for an evening of holiday discounts, vendor presentations, music and refreshments. Enjoy a 30 percent holiday discount on your purchases (includes 10 percent employee discount); 25 percent holiday discount on Clinique. Holiday discount also available on Thursday, Nov. 19, from 8:30 a.m.-6 p.m. SU I.D. card required. Bring a food donation to trim a turkey dinner in support of the Office of Engagement Program’s Fall Harvest Food Drive.